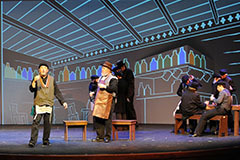 The set design for "Fiddler On The Roof" is entirely projections and back-lit silhouettes of actors onto a fabric cyclorama. 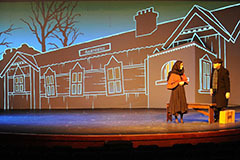 The main scenic projections are from the front. In addition, a hard set piece "wedge" is positioned in front of the cyc to add dimension to the projection. 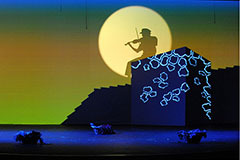 Also, rear projection shows the sun and moon, silhouetting the fiddler. 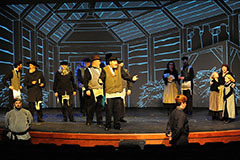 It was originally conceived for Music Theatre of Denton in Denton, Texas. The dimensional "wedge" becomes many things depending on what is projected onto it ... a chimney, a wood stove, a bed seen in a bird's eye view, a tombstone ... to mention a few. 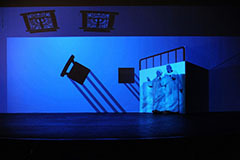 Depending on the position and projection angle of the front projection, the artwork will need to be adapted to work in other venues. It is possible to convert all the projection to be from the rear, with additional front projection for the "wedge." A totally flat version could be produced, not incorporating the "wedge." Contact Mr. Lamb to discuss how this property may be customized to your venue. 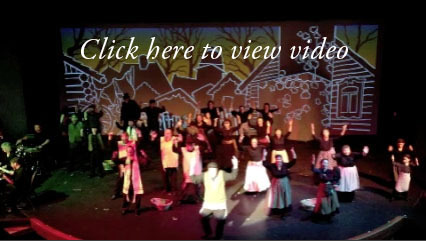 The video below has been quickly assembled from footage shot on an iPhone from the projection booth. 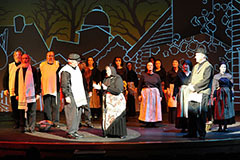 It excerpts most of the scene changes. A better video document is forthcoming. Between this video and looking at the still images to the right, one should be able to get a sense of how the show looks. Depending on your Internet connection speed, the video will take several seconds to load before playing. It will start by itself. Click here for a review of the show in the Denton Record Chronicle. Click on the photos below to see larger images opened in a new window.